Crafted from beautiful white gold and sparkling diamonds, and featuring an assortment of lustrous white or coloured pearls, our pearl brooches are the perfect way to add sophistication to a suit, or quality and class to a coat. Pearl brooch designs have come a long way from what your grandma used to wear, with today’s designs full of dynamic life and style. 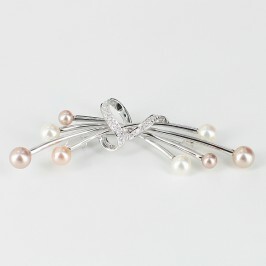 Versatile and vibrant, contemporary pearl brooches are a work of art to wear with pride. Our beautiful pearl brooches bring together the very best elements, including fine hallmarked 9K and 14K gold, dazzling conflict free diamonds and smooth, lustrous pearls. The result is even greater than the sum of these parts, creating something truly special. If you want to give her something she can wear whenever she wants to remind her of you, then a pearl brooch is the perfect present. Fashionable, versatile and incredibly beautiful, it will match with almost any look.